Back in October, I could not decide if I wanted to attempt NaNoWriMo. I first participated in NaNoWriMo in 2009, where I somehow managed to pass the finishing line before midnight on November 30th. It was stressful, but I did it, and I felt so incredibly proud of myself. 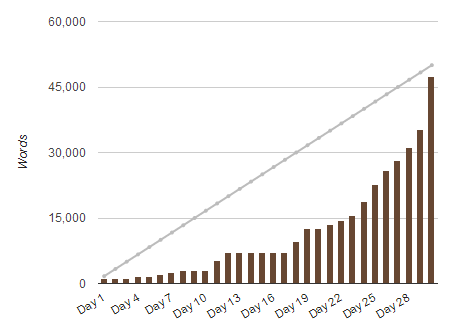 Needless to say, I was hooked from then on, and I have since faithfully returned to NaNoWriMo every new November. Each year, I won, and most years, it was a very close finish. However, I was only working during those years, and not trying to balance school, so this year, I just did not know if I should even bother signing up. But then my friends gradually announced their NaNo plans, and some of my coworkers said they were going to do it, and…well, now you know how I got suckered into it for another year. When I started NaNoWriMo thirty-two days ago, my original plan was to expand on a project I had started but never finished. As I started plugging away, it felt like each sentence was a chore. I don’t really need to recap that again, so long story short, a week into November, I started from scratch*. My new project was a riff off a fanfic I wrote just after high school because I thought, “Why not write something just for me?” There wouldn’t be the pressure to write the next Great American Novel, and I could make it as ridiculous as I wanted. So I took roughly the same narrative frame, changed the setting, axed several characters, and reworked a lot of stuff along the way, and it was wonderful. Writing can be fun! (Who knew?) Just as I lost the joy of reading while in undergrad, I had also mostly lost my joy of writing for awhile, which I reclaimed this year. It’s a good feeling–a really good feeling to have that pleasure back. If you aren’t enjoying a project, it’s ok to leave it be and work on something else. I know that writing–to be published–inevitably involves a lot of hard work *coughrevisionscough*, but if you feel like you aren’t getting anywhere, I think it’s ok to cut yourself a little slack and work on a different project. Maybe that’s hopelessly naive of me. I don’t know. I don’t get paid to be a writer. I just do it. My writing has come to reflect my expanding knowledge of the world around me. For writers, the internet has two faces. One of these faces hosts a world of distractions, but the other face gives writers ready access to others’ lived experiences. When I first started writing lengthier pieces in junior high, I wrote very white-washed narratives that maintained a lot of tropes that I hadn’t seen challenged. Now, I am much more purposeful in how I construct characters, who is included in my stories, and how people are portrayed. I guarantee that I’m not a perfect writer yet, but I hope that I’m heading in the right direction. Just look at that last day. Shoot, that last week was pretty monumental too. On top of my various work commitments–multiple part-time jobs–and grad school–literary theory can go die in a fire–I’m grateful that I had any time at all to write, let alone *almost* write 50,000 words in one month. I guess that means I never have an excuse not to write again. I think that also means that unless I’m 100% in support of a project, I would rather not spend my time and brain energy on it. I still hope to be published one day but not if it means I need to sell my soul for the writing cred**. So did you participate in NaNoWriMo this year? Want to share your triumphs and downfalls? *I did not count the words I had already written on this first project with the total words I wrote on the novel that I made my NaNo project for this year, and my husband pointed out that I probably wrote more than 50k this month and that I actually “won” NaNo. I disagree. **I am not saying that published authors are sell-outs. I’m just saying that for me, I will write what I want to write, and if that gets published, then great. If not, that’s ok too. I think most published authors would voice similar sentiments. This entry was posted in NaNoWriMo, writing, writing process and tagged fanfic, fiction, inspiration, nanowrimo, novel, writing, writing lessons, writing tips by Ellayne Shaw. Bookmark the permalink. That was an incredible sprint in that last week. Congratulations! I know you didn’t hit that 50k, but you got out there and discovered that you were capable of cranking out so many words in just a short period of time. For me, it was an exercise in discipline. I wrote almost every single day this month. I got ahead on some days, and took other days off, but all in all, it was a great way to make myself sit down and do it! Thanks and also, YAY, good for you! 🙂 I love how much we can learn about ourselves through NaNoWriMo.